I derive pleasure from creating one-of-a-kind wearable art. All my designs are inspired and influenced by an unusual piece of fabric, leather or glass or the unexpected arrangement of materials. The challenge of weaving a dramatic story with textures and shapes instead of words, gives me satisfaction. Successfully combining the mix of fabric, leather, organic fibers and other materials in fresh and unexpected ways is a wonderful creative challenge. Fish leather enhances the Llama fleece vest and the closures on my clothes might be combinations of vintage buttons and modern day machine parts. The leather belts and bags combine rich textures and colors and are decorative as well as functional. A signature feature of my work is the innovative use of industrial buckles as counterpoint to the appeal of handcraft. (see details - How to Buckle Your Belt). The materials ultimately inspire the design and appearance of the individual piece. The glass necklaces (including “Schwanensee” a limited edition of 12 which were originally designed for a special exhibit at the Embassy of Switzerland) are also richly textured. Composed glass fragments are surrounded by crocheted monofilament. Each glass necklace contains “memory chips” inspired by visits to the Opera Haus in Zürich. I explore the reflective nature of glass because it not only becomes the visual carrier of information (parts of the ticket, small bits of the opera program) it also captures the wearer’s reflection and ever-changing traces of the wearer's surroundings. A member of the Torpedo Factory Arts Center in Alexandria, Virginia, Annemarie’s one-of-kind wearable art is represented at the Fiberworks Gallery #14. 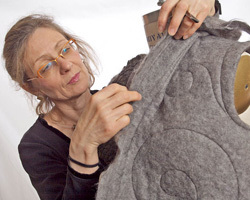 Born in Switzerland, Annemarie worked as a crafts teacher before moving to the U.S. in 1975. She received an additional degree in Communication Arts and Design from the Virginia Commonwealth University and opened Feld Design in 1980, designing award-winning visual communications materials for multi-national clients based in Europe and the United States.